From Paris, we hopped on the train again and in two hours we were in Lyon. We were first timers and although the weather was a bit grey and crisp, it was a great introduction to the city. 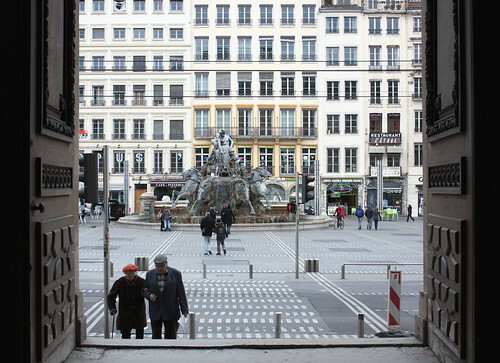 As tourists we fall into the Paris trap and put on hold the curiosity to see other places. After living in Manchester for a few years we know very well how it feels for a big brother to steal the limelight. While visiting London we were always asked why do we live in Manchester. There seemed to be no good reason to stay in a place also referred to by some people as “the armpit of England”. I guess we are the type who love armpits, somebody has to be. 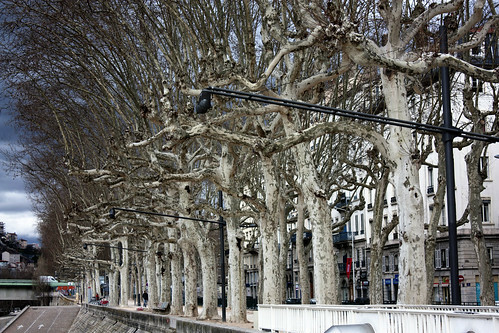 I diverge, back to beautiful Lyon. We started our first evening with a visit to the Lyon Opera for a concert: ‘Turquie – Les voix de soufism d’Istanbul’ with the ensemble ‘Mehmet Kemiksiz‘. A beautiful concert that reminded me quickly of my new found love for Istanbul and made me miss the beautiful colored bowls we bought there for my birthday. I have proclaimed my love of walking tours before and Lyon was another good reminder why I love them. You get to walk and listen to stories. Enough said. Not only did we book one, but two walking tours for the day. 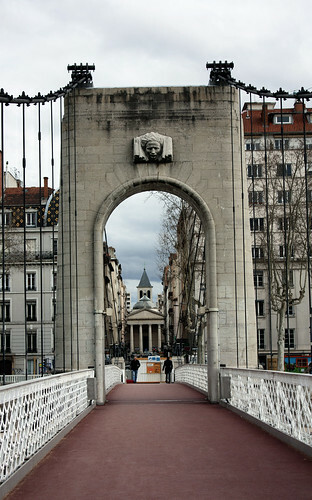 For the first one, our lovely lady guide took us through the history of Lyon. She told us about the many times the city reinvented itself and she showed us our first traboules. Silk trade and weaving has been the driving force for the local population and industry for hundreds of years . It was incredible to hear about the intense working and living conditions. A strict hierarchy would keep the workers in a vulnerable position. The buildings were constructed to allow the weaving machines in homes near the window, so that the workers could take advantage of natural light as long as possible. The sound of the machines created a continuous humming soundtrack. It was in Lyon where a lot of the changes were started for workers’ rights, things we benefit from today. On our last day we spent walking around and taking the funicular to the gorgeous La Basilique Notre-Dame de Fourvière. The dinner choices were done in advance. 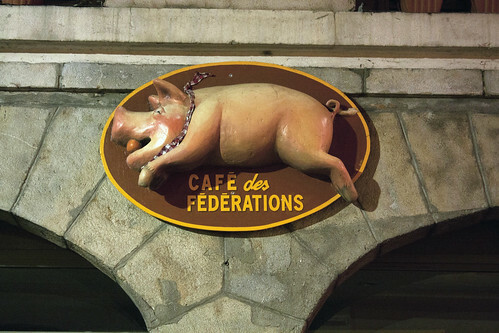 Café des Fédérations, was the first one to end a long day of walking, where we went in and without a particular menu choice, food kept coming our way in quantities that pushed me to be uncomfortably full. Excellent traditional food, happy atmosphere, a pig collection and decorations, all in all, a brilliant end to our day. Chris still talks about it. The second night we went to a related restaurant, Le Bouchon des Filles. Repeated experience, a bit more quiet but still great food. 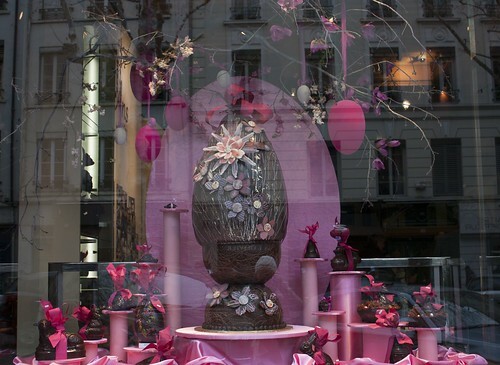 We were in Lyon before Easter and if someone knows how to embrace Easter, well chocolate shops know. 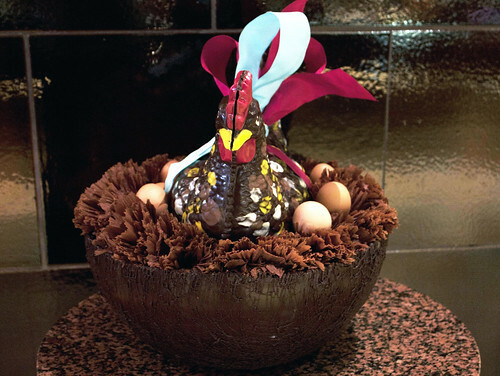 They seem to confirm chocolate sculpting as a bonafide art form. 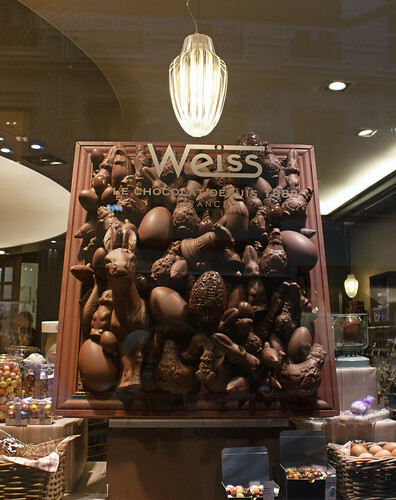 First, Weiss had some beautiful displays. In one of their shops, a lovely lady kept spoiling us with samples; I felt I could spend a couple of hours, at least, chocolate tasting with her. Family members instructed us that we will be expelled if we do not go to Bernachon. Listed in various chocolate obsessed lists as a must visit, we ventured on a Sunday. Not very good research on my part because they have a Café too, it’s closed Sunday. But no worries, the shop was open and we departed with a bit of money and gained a valued stash of chocolates that lasted us for three weeks. I also had the best chocolate éclair I have ever tasted. I was very good and I did not buy any breakables, nor heavy books this trip. This time we picked something small to decorate our not-so-lonely-anymore walls. From a gallery we were passing by, we snatched a small piece done by Estelle Régent with a gorgeous colored tree, with leaves floating away and becoming fish. It is a very happy looking little painting. These are some fond memories of yet another good trip, one that ended on a train towards the airport, heading to Rome. My first encounter with Italy was about to start. This entry was posted in The Wanderer and tagged 2013, Bernachon, Café des Fédérations, Le Bouchon des Filles, Lyon, Mehmet Kemiksiz, traboules, weiss. Bookmark the permalink.